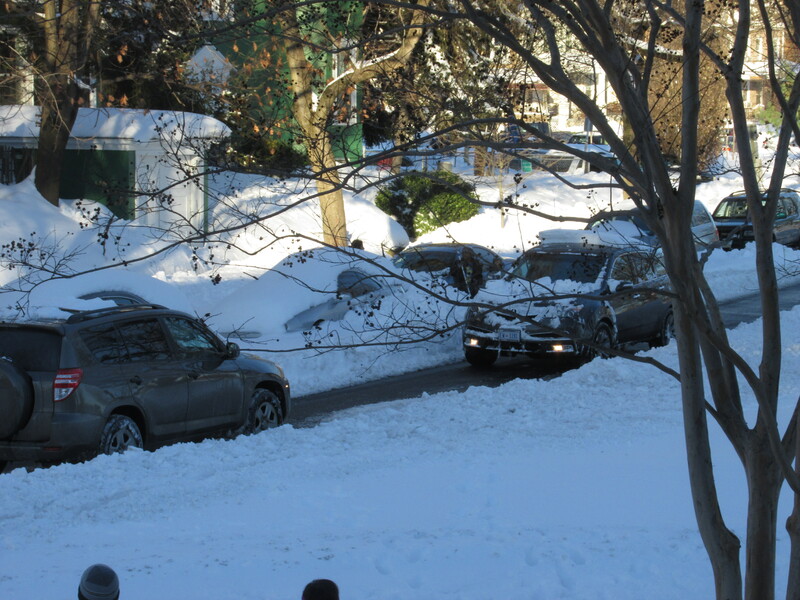 Blizzard Over, Digging Out Underway | Park View, D.C. 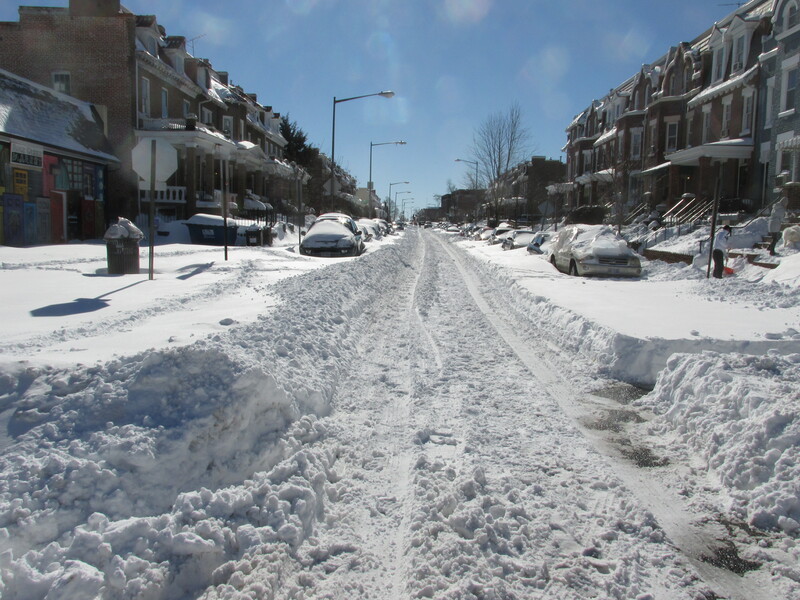 The Blizzard of 2016 has come and gone … and while the official snow total for DC may never really be known … we do know that it left a lot of snow that will take a while to remove. Two cars on Rock Creek Church Rd, where a single clear lane required cars to back up to allow passage. As of Sunday, a walk around Park View north of Park Road indicated that Georgia Avenue was reasonably clear. 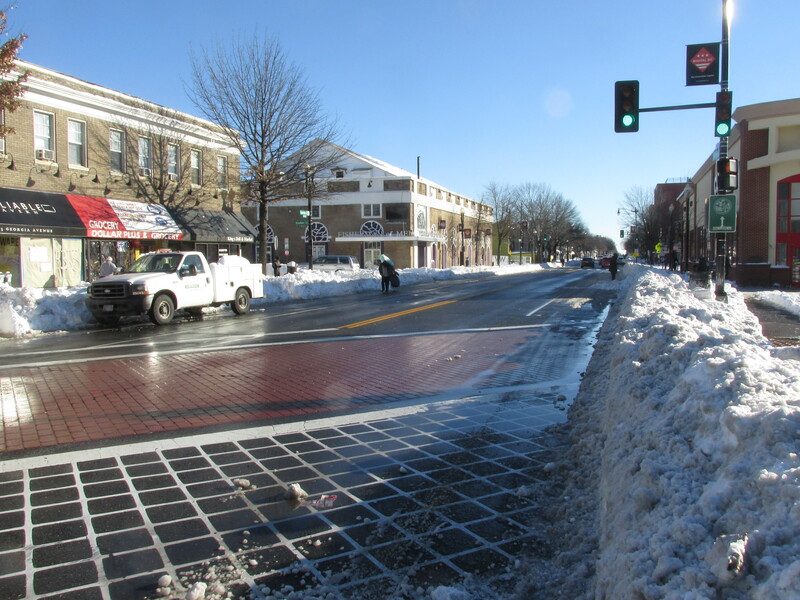 Streets like Warder Street, New Hampshire Avenue, Park Road, and Rock Creek Church Road (one presumes Irving and Columbia Road as well) were plowed for one lane of traffic. I personally observed how even this was inadequate for those who ventured out, as a single lane on Rock Creek Church Road often lead to cars meeting head on in the middle of the 600 block requiring one driver to drive backward to the next intersection to solve the impasse. Other unsafe road conditions included vehicles traveling northbound on Park Place and youth on ATVs driving around the neighborhood during the afternoon. 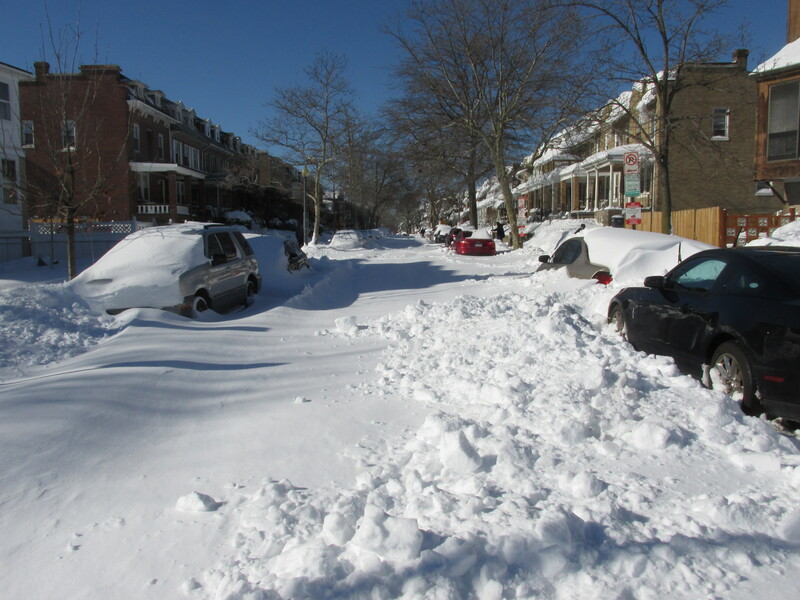 Many side streets as of last night had been entirely unplowed — with good examples being the 700 block of Newton Place and the 600 block of Quebec Place. 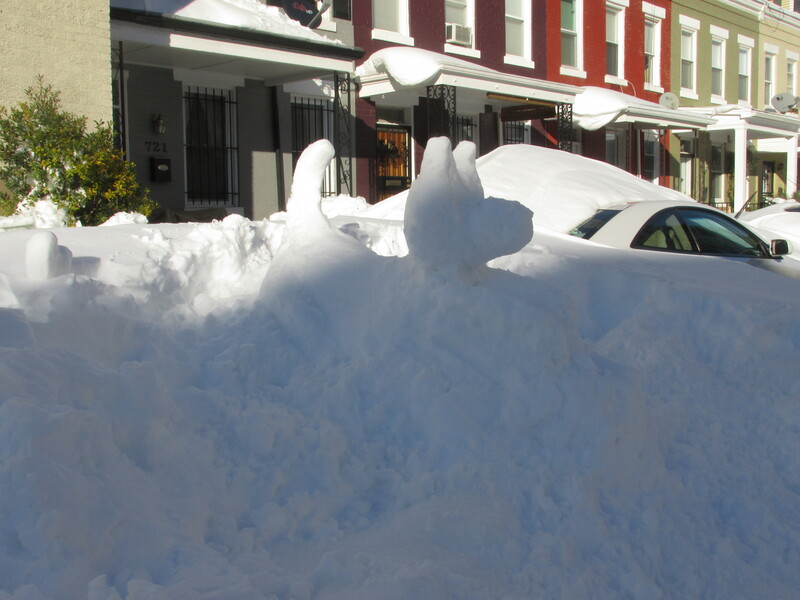 Yet the snow-filled streets offered the occasional opportunity for fun and playfulness among those digging out as the snow puppy carved from a snow drift on Newton Place shows. 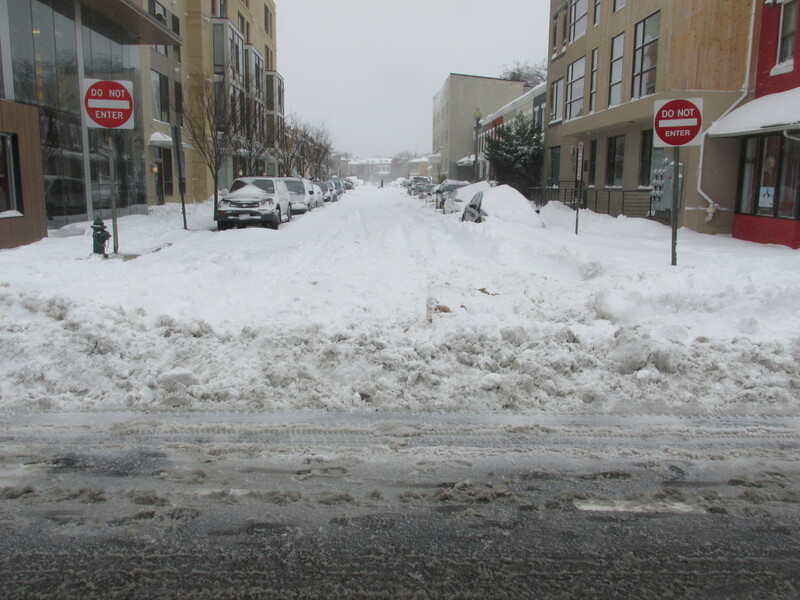 One area that was plowed extremely well was the 600 block of Morton Street, where the DC Housing Authority was on top of keeping the street and sidewalks around Park Morton clear, not only before the storm reach full blizzard conditions but also throughout the storm and during clean up. All in all, after the first full day of digging out most residents and businesses did a fairly good job of clearing sidewalks or helping out those that needed assistance. More shoveling is sure to continue today as not all walkways were clear. Below are a few photos showing conditions around the northern section of the neighborhood on Sunday. This entry was posted on January 25, 2016 at 7:01 am and is filed under weather. You can subscribe via RSS 2.0 feed to this post's comments. “youth on ATVs”? Try “criminals on ATVs”.